Sometimes you need to transfer images directly to your computer without the fuss of taking the card out and slapping it into the card reader, doing an import and waiting. Tethered capture is an easy alternative. Sometimes you need to transfer images directly to your computer without the fuss of taking the card out and slapping it into the card reader, doing an import and waiting. You may be shooting entirely in a studio on a tripod or even handheld without a lot of moving around. You just need fast transfers. You need to shoot tethered. Normally, when shooting tabletop, I use a wireless connection to my iPad which I use to control the exposure and preview the image, because I often can’t see through the viewfinder. But sometimes, I’m shooting people, like little kids on Santa’s knees, or in their Halloween costume, and I need to give them a print quickly and move on. I do this for my local community hall at special events. When I’m shooting these events, I use a 15 foot tethering cable to my laptop. When I take the shot, it quickly moves directly to the laptop and I can select the best shot and print it within a few seconds. In comparison, when I used to do this by taking the card out of the camera, the backlog could be an hour. Not good. I bought a 15 foot USB 3 cable from Vistek for $$$. If you go over 15 feet, you need to buy amplified cables or a repeater/amplifier between two cables. I didn’t need to. Plug the cable into the camera’s USB 3 port, and plug the other end into the computer. Select “Tethered Capture” in Lightroom (it’s under File). Tell Lightroom what folder to put the images in. A window will pop up with a button which can release the shutter and make some rudimentary controls on the camera, but I prefer to use the controls on the camera itself. When you press the shutter release on the camera, the image will transfer over the cable directly to the computer. It will not save on your camera’s cards. Do not make the mistake of shutting off the camera or disconnecting the cable until the images make their way to Lightroom, or you will lose them. The images will show up in the Library tab. I tend to leave the Print tab open so I can print directly from there, but it only shows the latest image. If I need to use an earlier image, I have to back to the Library tab. 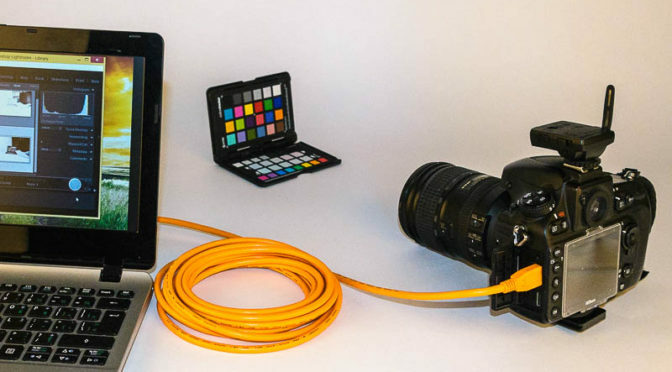 So, tethered capture is easy, cheap and although not hugely fast, it beats the alternative.